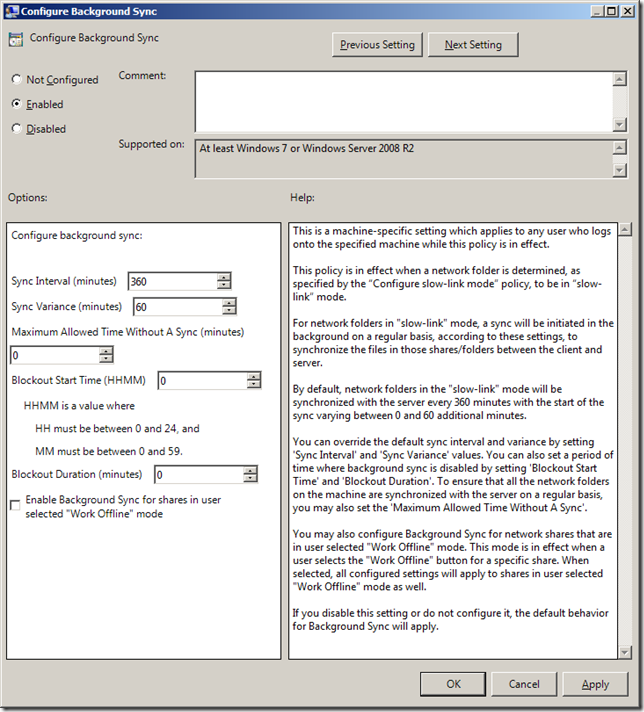 This weeks setting of the week is second is another one of the new Windows 7 offline file settings called “Configure Background Sync” which can be found under Computer Configuration > Policies > Administrative Templates > Networks > Offline Files. 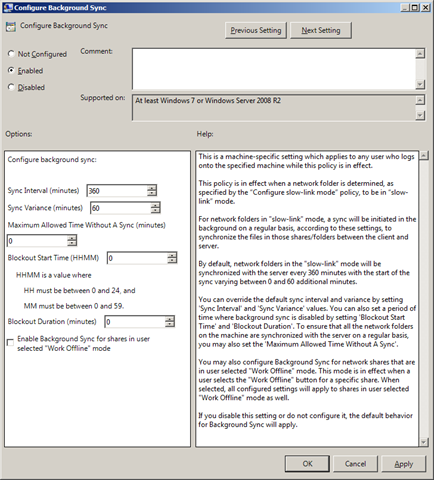 This setting allows you to configured the new Windows 7 feature that background sync’s offline file when a computer is in “Slow Link” mode. Configured this setting would be very useful if you have a large number of computers at a single site that sync their files over a WAN link. In this case the background sync of a large number of users could cause a large amount of traffic. You could then use this setting to back off the sync interval. You may also want to do the opposite and crank up the sync interval to ensure that users files are being saved to the server as soon as possible. The other scenario where this could be used if for users that are running Direct Access mode or a VPN and you just want to control the amount of traffic they push via their connection. There is also and option called “Enabled Background Sync for shares in users selected “Work Offline” mode” which forces offline files to sync even when the users has manually chosen offline mode. I would be careful of this setting however as this behaviour might confuse as they might create the document thinking that it was not going to be saved to the server straight away for other people to view. ← I’m a Microsoft MVP!!! Alan, is there a way to enforce that users offline files stay synched even after they attempt to “fix” the scheduling? My Windows users (all unsing Win 7) use folder redirection (via User GPO) for Documents, etc and a few of them have attempted to adjust the scheduling of synchronization. I need to enforce offline sync to occur like it would naturally (immediately at moment of change) instead of certain days/times. How can I modify the GPO to set the behavior for all redirected users back to “normal”? You can make it sync as soon as it has been saved… But… there is a policy setting that allows caching of the files but the users will only go offline once latency goes above a pre-defined latency… It will be my next weeks Setting of the week. The problem that I am encountering is that these problem users are working from their cached copy of the files and these changes only get synched to the network on a schedule that they have set. I don’t want a schedule, I want 100% synch rate like everyone else. If files go offline below a predefined latency that won’t impact the synch immediacy. Then you might want to set the offline files thresholds to be set at a very high threshold so that they are always working online…. slowly… but online. Works like a beauty… Got the solution from you, appreciate your help. Is there a way to configure alerts so if a user has not sync’d in a specified time they get a message letting them know this?